Ground-breaking drugs, innovative supplements, and guru diets are making the news every day. Notwithstanding all “medical advancements,” year after year Americans are getting sicker and more overweight. 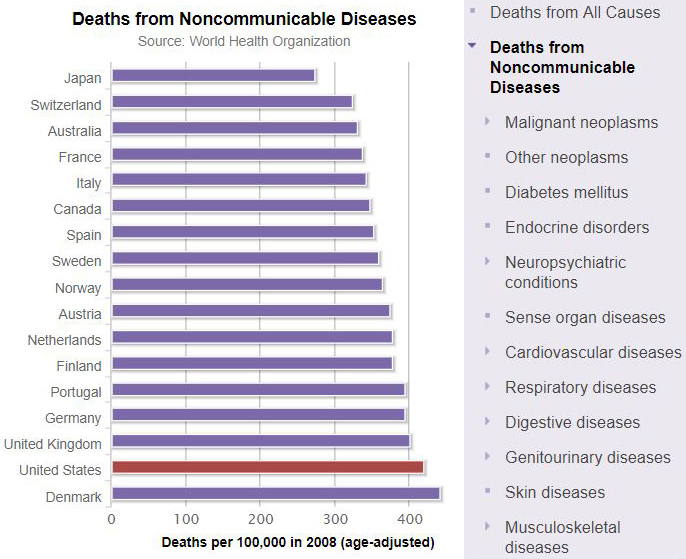 American’s deaths from noncommunicable diseases are estimated to rank 16th among the 17 most industrialized countries. The good news is that by reducing the abuse of this ONE non-nutrient, most could live a longer, healthier, and happier life. By reducing the abuse of this ONE non-nutrient, both young and old can lose pounds while at the same time significantly prevent diabetes, cancer, heart disease, arthritis, dementia, and Alzheimer’s. Reducing the abuse of this ONE non-nutrient can also liberate you from the “silly” new concept of having to count calories. And conservatively speaking, if YOU were to stop the abuse of this ONE non-nutrient, there is no doubt that it could make you feel and look younger, and dramatically reduce your chances of touching another prescription drug. Even better, if a majority did it, chances are it would largely reduce the epidemic of obesity, diabetes, and deaths from the top six killer diseases in America. This non-nutrient, whiter than cocaine and deadlier than any illicit drug, is refined sugar “the silent killer” sitting in your kitchen. This white refined crystalline substance is a denatured molecule extracted from sugar cane, corn, or sugar beets, in the process separated from its life-giving co-factor vitamins, minerals, enzymes, and phytonutrients in its original whole food state. What is left is a concentrated and inorganic substance which the human body is not made to handle, certainly not in anywhere near the quantities ingested in today’s accepted lifestyle. Additionally, in this concentrated form, sugar is addictive. The average American now consumes between 150 to 170 pounds of refined sugars in one year! This is per man, woman, and child. The use of sugar, known as sucrose, is the main culprit in diabetes. Currently, 20 million Americans have type II diabetes and it is estimated by the Centers for Disease Control and Prevention (CDC) that this rate is growing at epidemic proportions. Sugar is a principal culprit in obesity. Approximately 800 people will die from obesity today. When given sugar, cancer grows like a wildfire on a windy day. Today, more than 1500 people will die from cancer. While there is some publicity against the abuse of sugar, its true devastating damages are rarely, if at all, spoken about by the organizations responsible for health in America; the American Diabetes Association, the American Medical Association, the several cardiology and heart organizations, the National Institute of Health, and even the United States Department of Agriculture that put out the food pyramid. Sadly, very few world-renowned health gurus, wellness authors, and wellness practitioners ever mention it. It is ingested in massive quantities. The damaging effects begin from the day a baby is fed sugar in its formula. Even mothers milk is contaminated with it if the mother eats sugar. 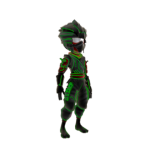 Practically 95% of people are addicted to it to some degree or other. Unknown to most people, most packaged foods are loaded with sugar. These reasons account for the outrageous amounts of sugar people in civilized nations consume. Americans are told how they are the best-fed and best-nourished people on the face of the earth. If we are talking about processed junk food – this is true. If you examine the “foods” in any supermarket more closely and start reading labels, you will find just about everything contains sugar. Most of the foods are loaded with it – from cereals to soups, mayonnaise, mustard, bread, to ketchup, to hot dogs. Some cereals are as much as 50% sugar. It damages your heart – A Harvard University studied thousands of American adults over 15 years and found those consuming 25% or more of daily calories from refined sugar were more than twice likely to die from heart disease. “No sugar added” doesn’t mean no sugar – even if the label says “100 percent juice”, don’t chug with abandon. Even without added sweeteners added, there is way more concentrated sugars than in the whole apple or orange, which is high in fiber, and other nutrients. Excess sugar linked to Alzheimer – Bath University researchers found a molecular link between high sugar diets and early Alzheimer’s. A glycation reaction that affects cells causes damage to an important enzyme responsible for the reduction of protein buildup in the brain, characteristic of Alzheimer’s. Sugar spike blood pressure and cholesterol in children – A meta-analysis in the Journal of the American Medical Association found that sugar does not affect children’s behavior (questionable), but they found that it does spike blood pressure and cholesterol. A 2016 study in the journal Obesity showed that reducing kid’s sugar consumption for just nine days led to improvements in those areas, as well as blood sugar levels. Stealth sugar in most snacks – 12 grams of sugar per serving in flavored oatmeal packets, and adding a tea spoon of brown sugar makes it 12 grams – store bought granola adds 6 grams for a total 19 grams of sugar when added to a standard fruit flavored yogurt which may contain 13 grams of sugar – an average store bought smoothie contains between 30 and 80 grams of sugar – this commercial trail mix packet that you stash in your car for a healthy snack on the go may contain 16 or more grams of sugar – grabbing a healthy salad for lunch ends up a disaster when adding popular salad dressing or vinaigrette that contains 4 or more grams of sugar per tablespoon. Sugar is leading in non-alcoholic fatty liver disease (NAFLD) – Laura A. Schmidt, the lead investigator at the University of California School of Medicine, has become an “authoritative scientific source on sugar and its impact on health”. Consuming too much fructose which occurs naturally in fruits, is worse for the liver than alcohol. One visible red flag, a “sugar belly”, yes like a beer belly. Why? Fructose, unlike other forms of sugar, is processed in the liver which breaks down excess fructose into fat globules that travel through the bloodstream and lodge around your midsection and internal organs. And like alcohol liver damage, NAFLD causes inflammation and scarring. “It is one of the leading causes of liver transplants,” Schmidt says. Healthier “sugars” are no better for you – Many are trying to cut down on refined sugars, and use more natural options like honey or maple syrup. It turns out that these options are no better for you if you are still consuming too much. All sugar provides some energy in the form of calories, but these alternatives also do not offer a significant amount of co-factor nutrients that should normally occur with foods. So, it’s best to use sugar, any sugar in moderation no matter what form it takes. Cancer cells love sugar – a study at the University of Dallas shows a direct link between sugar and squamous cell carcinoma, a hard to treat cancer that accounts for 25% of all lung cancers. The study also found four other types of squamous cancer cells that consume a lot of sugar. Sugar may disturb your sleep – A 2016 study in the Journal of Clinical Sleep Medicine shows eating more sugar (along with less fiber and more saturated fat) is associated with lighter, more disrupted, and less restorative sleep. 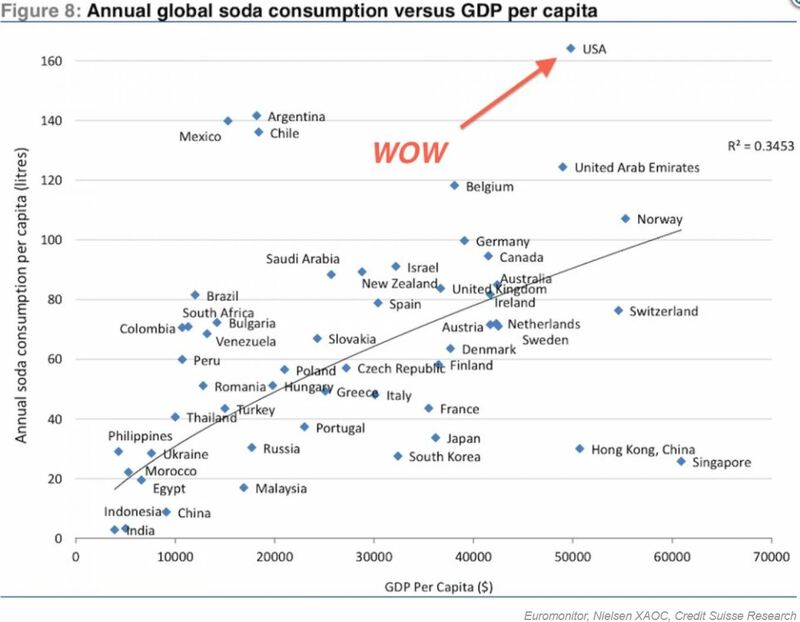 Pops replaced with just as unhealthy options – we’re drinking less pop than a decade ago. Bad news, a 2017 report from the University of Waterloo found that in the last ten years, sales of energy drinks increased 638% while sales of specialty coffees increased 579%. Energy drinks contain about 84 grams of sugar, sports drink about 40 grams, and your average flavored latte comes in at around 36 grams. Sugar messes your cholesterol – In the Journal of the American Medical Association, a 2010 study of 8,495 Americans over 18 found that as subjects added-sugar intake went up, their level of HDL (good cholesterol) dropped increasing their risk for cardiovascular disease. In this study, women who ate more added-sugar had a higher level of LDL density (bad cholesterol). 66% – The proportion of packaged foods that contain added sugar, a Canadian Medical Association Journal study from 2016 that analyzed over 40,000 items on the shelves of one of the nation’s biggest retailers. 54% more likely to be overweight – According to researchers from the Universities of Reading, Cambridge, and Arizona State, in a study of 1700 men and women, age 39 to 77, those that ate the most sugar were 54% more likely to be overweight. (that is, have a BMI over 25), and were more likely to have underreported how much of the sugar they consumed. Sugar takes your breath away – Scientists have long suspected a link between sugar-sweetened beverages and asthma. After analyzing data from 146,990 adults in the U.S., they found that, sure enough, adults who downed at least two of these drinks a day were more likely to have respiratory issues. Sugar worse than salt for hypertension – Normal blood pressure falls between 90/60 and 120/80. According to a study published in the Journal of the American Society of Nephrology in 2010, a high-fructose diet can push your blood pressure over the threshold of 120/80, which is considered the upper end of normal. In a 2014 research review published in the BM! Open Heart journal, medical experts argued that sugar intake may have the most dramatic effect on modulating blood pressure and, in fact, could be more detrimental to heart health than sodium consumption. Sugar blues – Sugar can make you sad. Ending a bad day with a bowl of Ben & Jerry’s may make you feel worse in the long run. In 2015, Columbia University Medical Center researchers found post-menopausal women with diets high in added sugars and refined grains were at an increased risk of new-onset depression, while the risk decreased in subjects who ate more dietary fiber, whole grains, vegetables, and unprocessed fruits. You sip a sweet coffee beverage. Bacteria in your mouth thrive on sugar, which provides them with energy. Those micro-organisms multiply, creating a film of plaque on the surface of your teeth. The plaque produces an acid that dissolves the minerals that make up the hard surface of your teeth. The longer plaque builds up, the worse the damage. Tiny holes appear and expand until they become cavities. Are you addicted? – Though some researchers quibble with the idea that sugar is addictive, past studies, including a 2015 paper out of MIT, do show that the sweet stuff elevates levels of the neurotransmitter dopamine, which forms a key part of the brain’s reward and pleasure centers, in a way that’s remarkably like the effects of tobacco and morphine. “There’s growing evidence that sugar leads to cravings and withdrawal, which are the hallmarks of addictive disorders,” says Schmidt. “You can see the effects on an MRI.” Now, Australian researchers have discovered that drugs typically used to treat nicotine and cocaine addiction, such as varenicline, could be employed to help so-called sugar addicts kick their habits as well. Of course, if you are going to reduce something, it must be substituted with a healthy alternative. Unfortunately, this alternative is NOT the easy aspartame, sucralose, neotame, or newcomer Splenda which are often touted as sugar alternatives. Another sugar replacement is the stevia plant. Stevia extract effectively replaces sugar by offering a sweet taste without the negative side effects! And I hope that you’ll all agree that best way to reduce refined sugars is to include lots of raw fruits and vegetables in your diet. 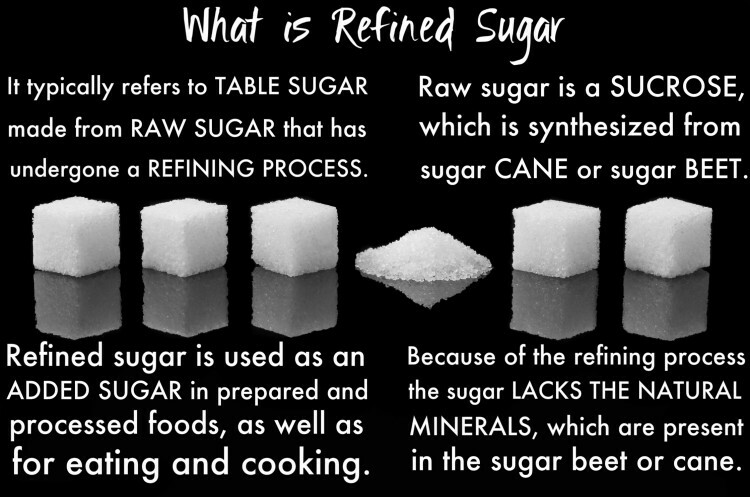 In my opinion, and a great defense against addiction to sugar is to know that most foods contain lots of natural sugar in them and to develop your awareness by chewing and tasting your foods well. And there are many books available about sugar, but perhaps one of the most interesting ones is “Sugar Blues” by William Dufty. It is available in most Health Food stores.